Sometimes, from nowhere a remarkable story pops up. Here is one. Carl Rodenburg was a general in the Wehrmacht of Nazi Germany who, during the Battle of Stalingrad, commanded the 76th Infantry Division. This Nazi was a recipient of the Knight’s Cross of the Iron Cross with Oak Leaves, awarded to recognize extreme battlefield bravery or successful military leadership. On January 31, 1943, during the Battle of Stalingrad, Rodenburg surrendered to the Soviet forces and was held in captivity until 1955. Allegedly, Von Rodenburg, who considered himself an invincible soldier of the Führer, often mentioned that he managed to shoot the person who took him a prisoner and that person was not Russian, rather some other nationality. (German General von Rodenburg case No. 296/133, jointly conducted by the USSR Military Prosecutor’s Office with the USSR GRU, in two volumes, 1943). Since 1940, a special Nazi unit named “Odessa,” in the division of von Rodenburg, was engaged in the development of biological weapons. This group bore special importance because included in the list of its members was Otto Skorzeny, the commander of Hitler’s favorite detachment, the SS saboteurs Standartenfuhrer and “doctor” Josef Mengele, who conducted criminal experiments on Auschwitz-Birkenau concentration camp’s prisoners. 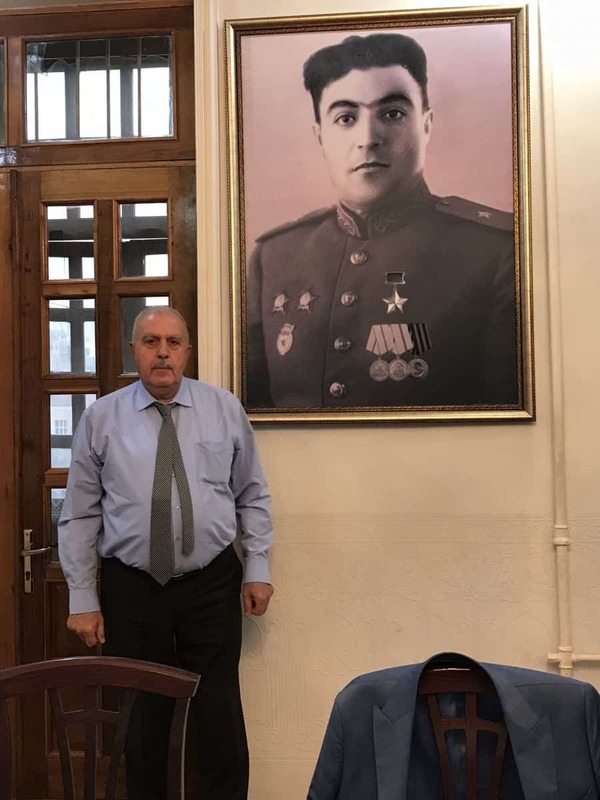 Hamza Jumshud oglu Sadygov was an Azerbaijani national who was an officer in the Soviet intelligence under the codename “Sadigashvili.” On the eve of the German troops surrender in Stalingrad, Hitler ordered Rodenburg to poison all the water wells and reservoirs. The Soviet intelligence could have easily eliminated von Rodenburg. However, being employed by Abwehr (The Abwehr was the German military intelligence service for the Reichswehr and Wehrmacht from 1920 to 1945), and due to the fact that since 1939 Rodenburg was a bearer of particularly important information, which the Soviets were after, the Soviets decided to capture him. Rodenburg’s particular work created serious danger of the use of biological weapons by the Nazis. According to the operation witness testimony, the German general Von Rodenburg was afraid of everything, even German soldiers and officers. During the assault on Rodenburg’s headquarters, while Sadygashvili’s group (H.J. Sadygov) lost many fighters, he, himself, put his submachine gun against the German general’s temple and forced him to kneel. The German however managed to make a sharp move and fired his pistol several times and wounded Sadygashvili (H.J. Sadygov), who rushed to Rodenburg and disarmed him. His soldiers forcefully wrestled the German general from the claws of Sadygashvili (H.J. Sadygov), who had already lost consciousness. According to the Nuremberg Trial investigation, capturing Rodenburg saved the lives of many thousands of Soviet people. Allegedly, von Rodenburg was 35 minutes away from attempting to use poisoning substances in Stalingrad. Materials from the Nuremberg Trials also indicated that von Rodenburg was experimenting with his lethal “inventions” in the field of biological weapons on Jewish pregnant women, Jewish children and prisoners. Sadly, at the Nuremberg Trials von Rodenburg’s war crimes did not play a priority role and were hardly investigated. German general prisoner … “ (Evidence: Office of the Political Archive of Volgograd, Section “SMERSH.” Letters from M. N. Shuvalov., 1942-1943). 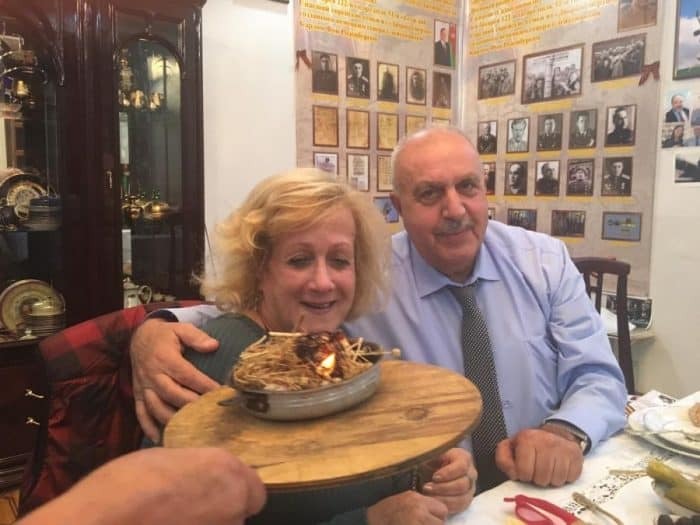 Firdovsi Sadikhov is the son of Hamza Jumshud oglu Sadikhov (Sadygov); by Jewish post Holocaust criterion, Hamza Sadikhov could be considered to be a Righteous Among Nations person. The subhuman General von Rodenburg, who personally exterminated Jews was called “the father of the biological bomb” of Hitler, who conducted tests on Jewish children. On October 2, 1949, the Israeli daily newspaper ‘Ma’ariv’ published an article its headline was “Debt” written by the military journalist I. Feldman, who gave detailed information about Sadygov’s actions. A copy of the newspaper is kept in the Museum of History of the Russian Federation. For many years the name Sadygov, matching an Azerbaijani hero, vanished from history books and memoir literature, and nobody knew about it. When many archives were opened and the half-forgotten names became public, the public made acquaintance with the name Hamza Sadygov, better known under the codename “Sadygashvili.” He was nominated for the “Golden Star,” the Hero of the Soviet Union for courage and heroism. Posthumously, the valor of Hamza Sadygov returned to his native Aghdam region, Azerbaijan. He is a local hero and his grave is located in Azerbaijan’s territories, illegally occupied by Armenia. It is rather painful and frustrating to have to bear the idea that the body of a hero, who had saved Jewish children from the Nazi fascists, lies in a grave, reportedly destroyed by Armenian vandals, and is now under the feet of the Armenian fascists, who, similarly to German Nazis, murdered Azerbaijan children in the Azerbaijani city of Khojaly and in other occupied territories in the nearby regions of Azerbaijan. On my last visit to Azerbaijan, a friend took me to meet Firdovsi Sadikhov, in order to hear firsthand an amazing historical and humanitarian story. It is a story about his father of whom he knew very little as a child and knows much about him as a grownup. When you enter Firdovsi Sadikhov’s home living room you think you enter a museum. 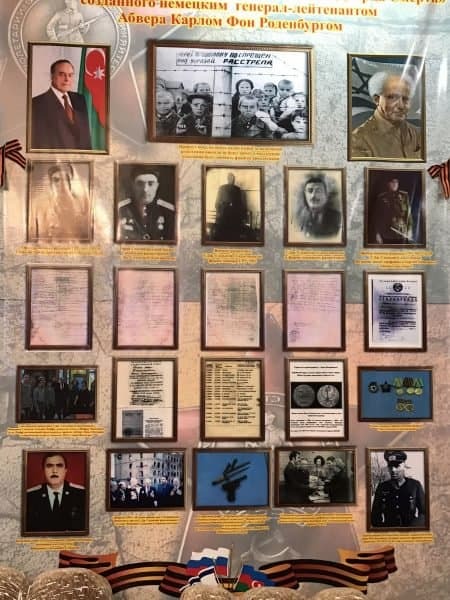 Two huge photos of his father, Hamza, one in full military gear, are each hung on a separate wall; photos of Azerbaijan’s leadership, along with photos of Israeli leaders, David Ben Gurion and Benjamin Netanyahu, and side-by-side are the flags of Azerbaijan and Israel. On one corner of the display is a photo of the Nazi General, von Rodenburg. At first your mind wonders; then, after you settled down to hear the story, while sitting at a table loaded with Azerbaijani traditional tasteful goodies, with your back to the intriguing wall display, it all starts to make sense and the story is heartfelt and deeply touches one’s humane core. In a suburb of Baku, the capital of Azerbaijan, I found a human treasure. Firdovsi Sadikhov, a retired attorney, is an elegant man whose hospitality is superb. For hours, indulging on Azerbaijani traditional snacks and drinks, we set and talked, mostly about his father and his own love and respect for Israel and the Jews. Firdovsi’s grandparents left Shusha and settled in Ogden in 1905, because in Shusha there was unrest between the Armenians and the Muslims living there. Firdovsi’s father, Hamza Sadygov, was born in Ogden in 1915 and lived there till 1964. Hamza Sadygov died in May 9th, 1964, at the young age of 49. In 1992, during the conflict with Armenia, the family moved from Ogden to Baku, leaving the grave of Hamza behind. The Soviet Russians did not like Jews and Muslims. While serving in the Soviet army ranks, to go with the names’ flow and camouflage its Azerbaijani origin, Hamza Sadikhov (Sadygov) changed his name to Sadikhvili. It is worth noting that there was no other Azerbaijani of such high military rank, a colonel. When, in 1945, Hamza Sadikhov (Sadygov) Sadikhvili returned home, he met with Mir Jafar Baghirov Abbas oglu, the communist leader of the Azerbaijan SSR, under the Soviet leadership of Joseph Stalin. Proud to have kidnapped von Rodenburg, Hamza was the pride of the Ogden residents. However, the Stalin loyalist Armenians living there did not want Hamza to be recognized and receive the medal of heroism he so well deserved. Firdovsi Sadikhov is extremely proud that a Muslim – his father whom he lost as a teenager, at the age of 15 – saved Jews. “Children are children. That kids were targeted to be murdered is troublesome,” he expresses his sentiments. “During the operation to capture Rodenburg, my father was shot; it was for a good cause to save children,” he summed it up. When he grew up Firdovsi had good relations with Jews. “We were all Azerbaijanis, I had Jewish friends,” he told me. When did you find out what your father did in the Soviet army? I asked Firdovsi. Curiosity lead Firdovsi to find material about his father. In 1976 he took off to neighboring country Georgia to partake in the Soviet Victory Day over Nazi Germany and there he met with comrades who served with his father in the Soviet army. Firdovsi holds deep love for Jews and the state of Israel. “If they are in trouble, I will take the side of the Jews. The enemy of Israel is my enemy,” he told me. 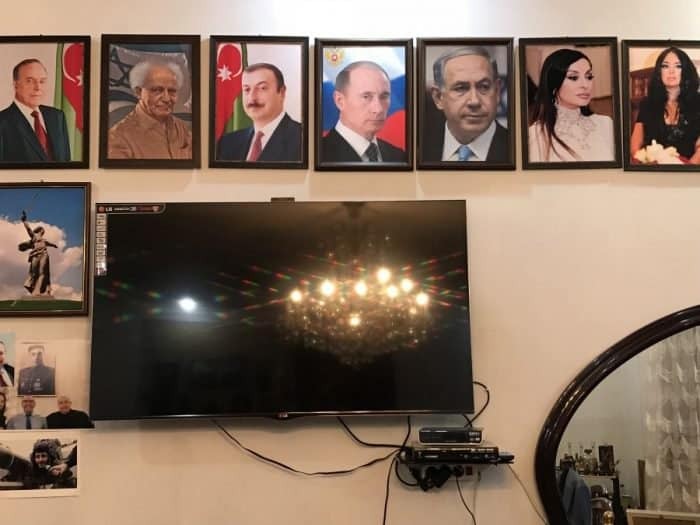 As an attestation, his living room’s walls are decorated with photos of David Ben Gurion, Israel’s first Prime Minister and Benjamin Netanyahu, the current Prime Minister of Israel. And the flags of both countries, Azerbaijan and Israel are side-by-side as part of the display. Firdovsi’s dream is for Israel to commemorate his father. Before his death, Firdovsi’s hero father told him: “The Jews will find you.” I, a Jewess, found him. I am sure other Jews also found Firdovsi. When Firdovsi Sadikhov ended investigating his father’s ‘adventures,’ as an intelligence office in the soviet army, he wrote a book, a collection of information that he gathered from Russian military libraries. I had many more questions for this righteous man Firdovsi. I could have stayed longer and we could have talked some more while eating the delicious Azerbaijani savories; but I had to leave to catch a flight back home. This is one more story to prove that people are people, good and bad. Hamza Sadygov was a Muslim who was born and grew up in the Ogden district of Azerbaijan and Azerbaijan has always been in his soul. He believed that Allah was always with him in war times. 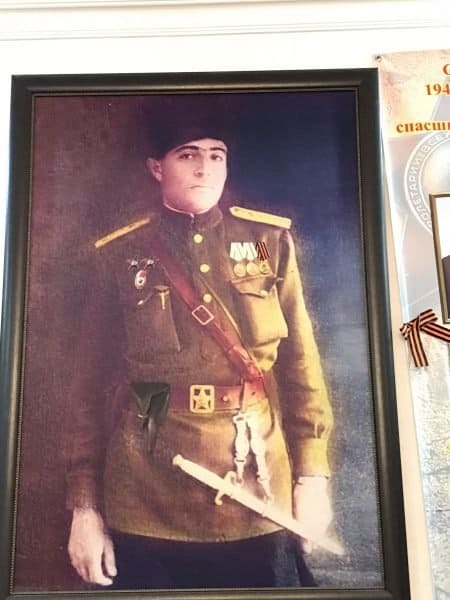 After the war, though local newspapers wrote about him incessantly, while everyone was looking for their medals and awards, the badly wounded Hamza Sadygov (Sadygashvili) did not look back. In Israel they endow people who helped to save Jews during the period of the Holocaust with ‘Righteous Among Nations’ recognition. Does Hamza Sadygov deserve this recognition? I say yes. For the Azerbaijani Nation it is all about people to people. Everyone is a human being first, before he or she is a member of an ethnic or religious group. That is why, I, the writer, respect the people of Azerbaijan and I will do all that I possibly can to help this nation just as Hamza Sadikhov saved Jews in trouble. I stopped counting the many floors I had to climb up to reach his apartment; on the 5th or 6th story lives Firdovsi Sadikhov, a man of modesty and grace and I had the privilege to meet him.